Cushions: Primark. Sofa: Habitat. Table: Madam Stolz. Lamp: Cox & Cox. I’ve always said that we have the best High Street in the world, and this goes for homewares, too. I have so many good High Street buys in my home, so thought I’d share my tips for making it work. It seems obvious, but try and limit your purchases from one shop. Yes it is easy to buy everything from Ikea (I know this, firsthand!) but the beauty of a home is all the bits and bobs you collect from different stores. And it also stops your home from looking like a showroom. These Primark cushions still look as fresh as the day I bought them (the cross cushion is over 4 years old) and mixed a luxe sofa, they hold up on their own pretty well. Lamp: £120, Matalan. Chair: £195, Ikea. 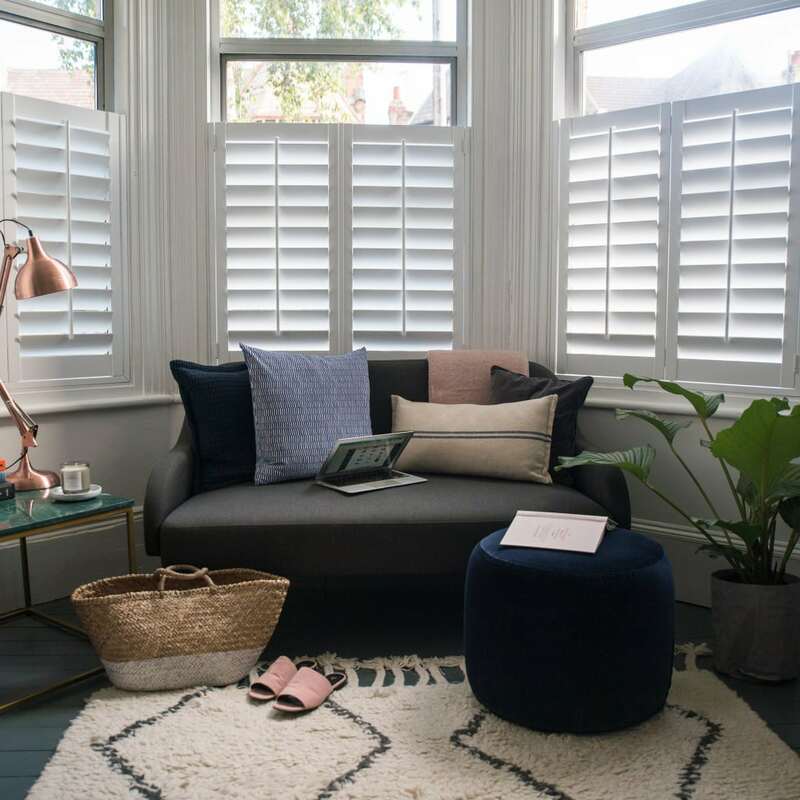 A lot of what I set out on my blog to do is eliminate the stigma attached to High Street shopping – yes, we are inspired by designer homes and amazing Pinterest images, but I always use this as a starting point to find what I want on a much smaller budget. I recently discovered Matalan’s lighting section and I honestly can’t believe I didn’t find it earlier! Other brands on my radar are Dunelm (we just bought a great wardrobe for Peggy’s room), Next, TK Maxx and H&M Home. Chair: Hay at Nest. Desk: £295, Habitat. Yes, I’m a High Street fan but even I accept that sometimes (but definitely not always), some things can’t beat the originals. I bought this Hay chair 4 years ago now and I still love it to this day, it’s an investment piece but something that will transform a room, and changes every time I put a different cushion on it. 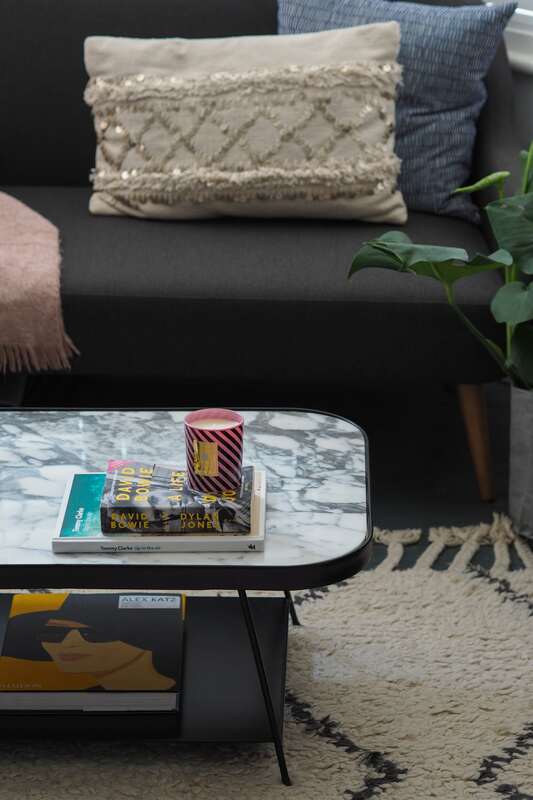 Brands I look to for a more elevated approach to home styling are: Hay, Ferm Living, House Doctor, Jonathan Adler, and most of the independent brands on Trouva. Coffee table: La Redoute (old). Sofa: Habitat. Candle: Jo Malone. Yes. sometimes you have to wait about 6 weeks for delivery and sometimes things sell out really quickly but they really have some of the best quality pieces out there for the price. It’s every Fashion Editor and Blogger’s not so well-kept secret. And if you time it right, they often do amazing 30-40% off discount codes, too. 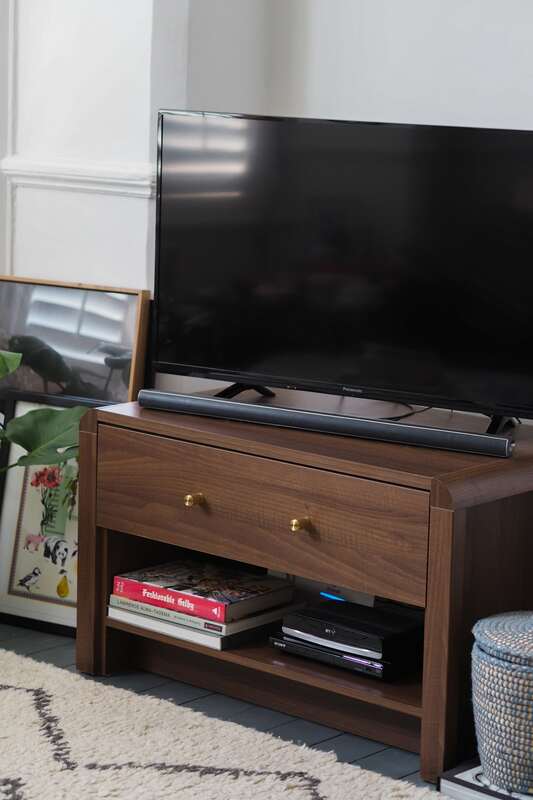 We bought this cabinet from Homebase about 7 years ago when we bought our first flat, it was actually a coffee table but it was the perfect dimensions for the cove in our flat and had excellent storage. The only thing that let it down were the handles, they were chunky and not very modern but I didn’t let that put us off – I knew this was the one thing that could be changed easily. We have since changed the handles on this cabinet a few times over the years, they currently have some Buster & Punch ones and they have given it a new lease of life. Chair: £170, Ikea. Sideboard: Local vintage store (sadly it has closed down!). 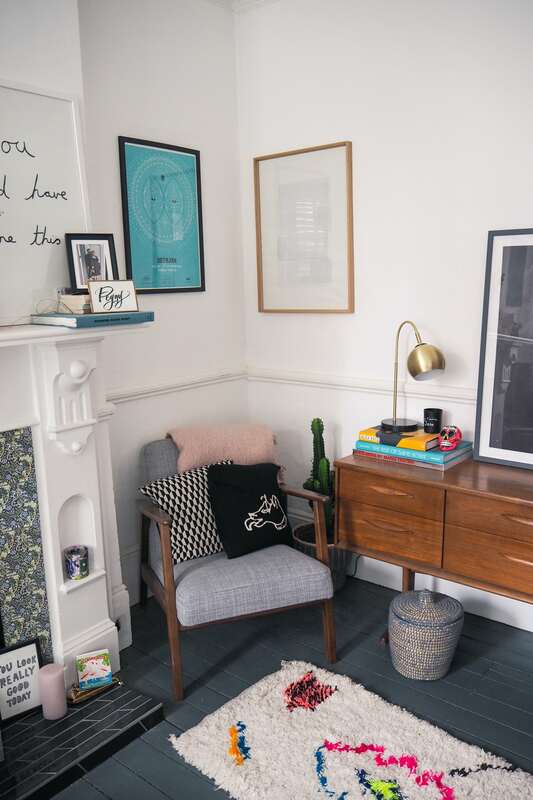 Again, I love mixing in furniture with a bit of history, a story to tell – whether that’s something handed down that you’ve painted, a sideboard picked up from a local secondhand store, or a repurposed record storage cabinet from Etsy (I’ve got my eye on one, currently) – it all adds layers to your home with a bit of personality, stopping it from looking too High Street obvious. 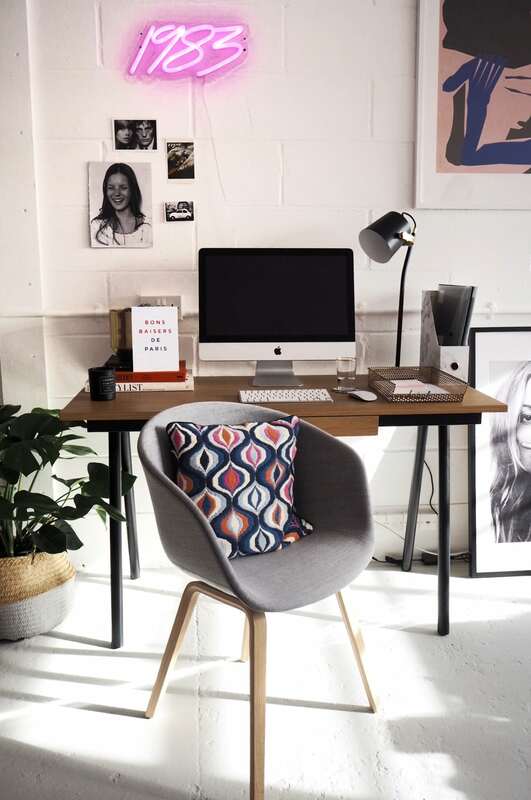 And if you’re not too vintage/secondhand savvy, like me, don’t be scared to try online shopping like Vinterior and Etsy – I favourite stores I found were good and make them my ‘go-tos’ – The Garage Vintage is my current favourite on Etsy. Frame: ‘Kupari’ at Habitat. Mount: Easy Frame. Print: £2, Battersea Carboot. I love framing prints, it can really make a little something you picked up look really spectacular. I like my frames to have glass rather than plastic (and have found Ikea very cheap looking these days). 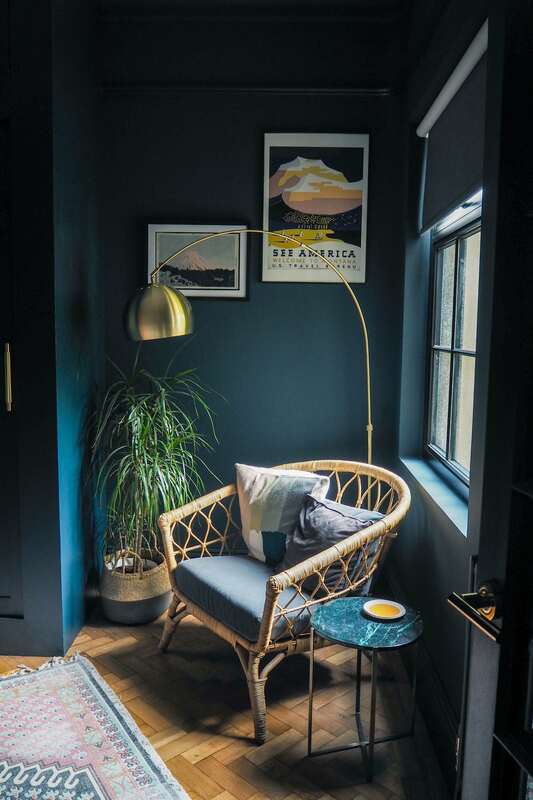 I have found Habitat to be the best (I love the oak and the gold frames), and have become a bit obsessed by mounting lately, too, and Eze Frame is a bit addictive as you can even upload your pictures to see how it would look in the frames! 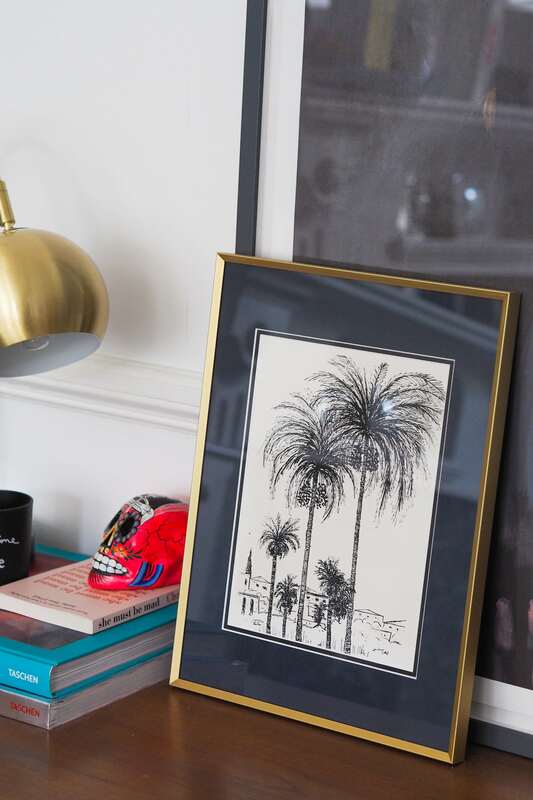 I don’t tend to buy prints from the High Street, I’m not sure why, it just doesn’t feel as genuine, I suppose – I would rather buy a cheap print or a map or a postcard and use that for art (the palm print above was one I picked up from Battersea Carboot and just changed the frame). And there are loads of amazing up and coming artists I love to support (from everyday affordable to more fine art). I buy prints from Etsy (for typography, or Lola Donoghue who is one of my favourites), Partnership Editions for a treat (I asked for a print by Jonathan Scofield for my birthday), Atelier Big Jon and I just got an amazing Italian Riviera photograph via Pampelone which I LOVE). Animal figure: £36, Atelier Buffo. ‘Love’ print: £24, Atelier Big Jon. Canopy: £92, Oskoe Living. Cot: £39, Ikea. Liberty print sheet: £40, Coco & Wolf. Basket: £18, Next. If you’re not sure on whether something on the high Street will stand the test of time, go minimal. 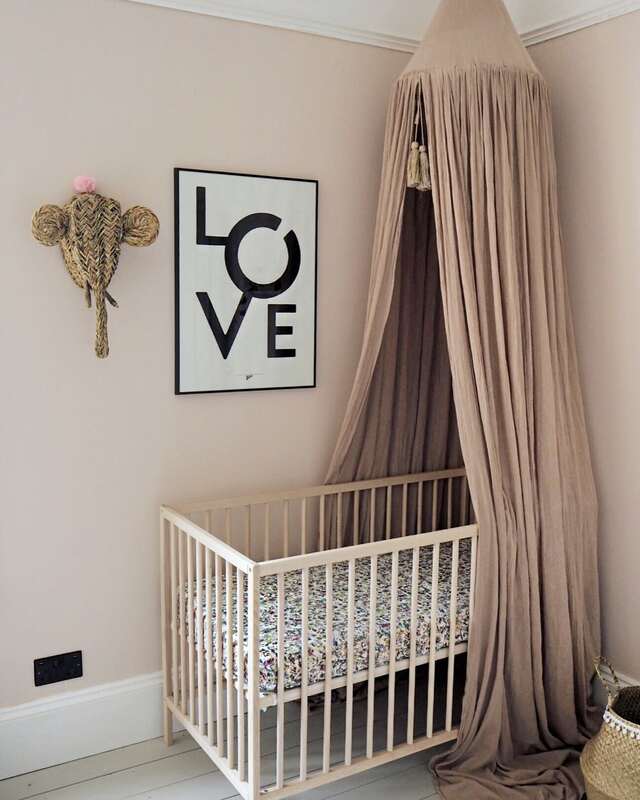 It will simply look chicer for longer, and you can always jazz it up with accessories – case in point, Ikea £39 basic cot made ‘wow’ with the extra bits. We couldn’t decide on which cot to buy, they all had three drawers, extra pockets and handy shelving, and in the end we just went with what we liked – and it ended up (luckily) being the cheapest. Shutters: Californian Shutters. Sofa: Habitat. Long cushion: Sluiz (bought in Ibiza). Blue and white cushion: £12, Ikea. Pouffe: £95, Ikea. Basket bag: The White Company (old). Sandals: H&M (old). Rug: West Elm. I mean, we all love Ikea, right?! 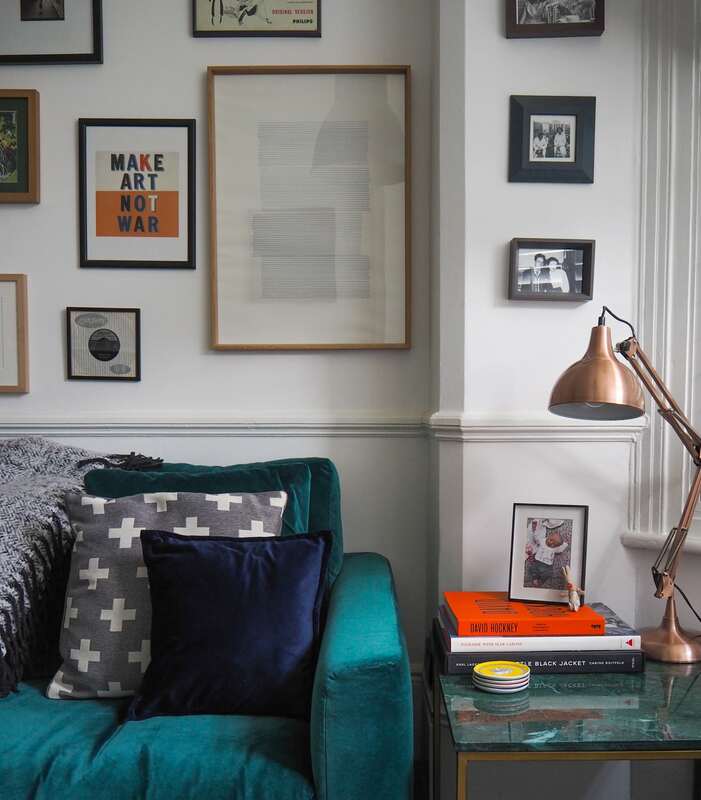 The Daim bars, the hotdogs, the Stockholm cushion that just about every single home has…. This is my point. My fear is that someone will walk into my living and say ‘oh, I have that, too!’ to everything I own. It’s mainstream, I know, and it’s bound to happen, but wouldn’t it be nice to have an inch of personal style in your home? I have a lot of Ikea in my house, but (I sincerely hope) it doesn’t feel like I have a lot of Ikea in my house. Why? Because I hide all the chairs behind cool cushions, I try not to go for the obvious stuff (black and white NYC canvas with a yellow taxi, anyone?) and I limit myself to things I truly love and will go with other things I own. “It’s important to buy the pieces you like and not concern yourself too much with whether things will match or go. Sometimes great things happen when you mix it all together” Vicky Charles, Interior Designer. Ecelecticism at its best. No wonder I love all of Soho House’s style. I love your interiors, you’re not afraid of experimenting, and following your own way, and it pays off. I do think mixing from different places is the key. I’ve seen an interior with high end pieces, but it ended up quite bland because it was too matchy matchy. We have some high end pieces (some bought second hand), a few inherited pieces (including my FIL’s apprentice piece cabinet), but the majority is high street (albeit Danish high street). For me it’s the ecclectic-ness of it, a lot of our pictures reflect my British heritage, but the furniture is more Danish minimalist. It’s a mix that makes it personal to us as a couple! Your interiors are absolutely stunning! You have such a brilliant eye for style! 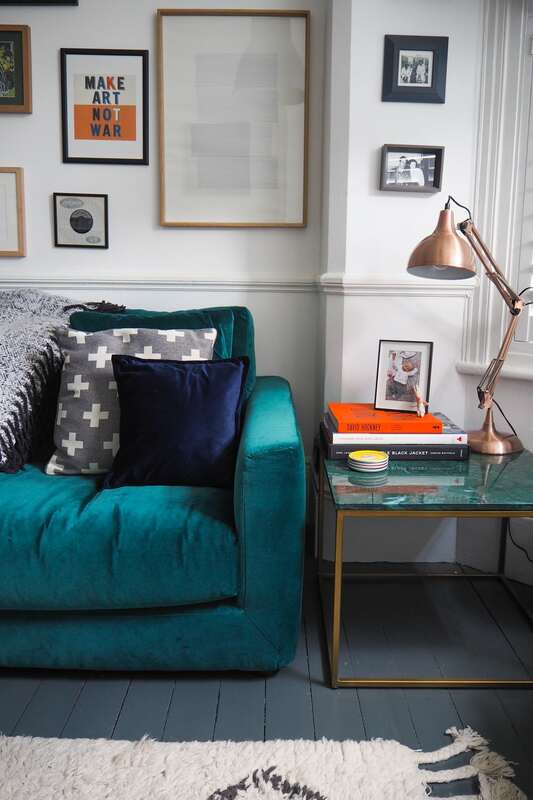 I’m redecorating at the moment so this post is exactly what I needed right now – currently on the hunt for some cushions and I didn’t realise how difficult it would be to make up my mind on even the smallest things! I’ve been following you for a while on insta but just discovered the blog today- it’s excellent! Thanks!! Also where did you get your shutters from in the living room? Alex, I really love your sense of style. Every time you post about interior stuff (or fashion or anything really!) I always go „YES! !“ in my mind. I would have zero problems moving in to your house and leaving everything as is. 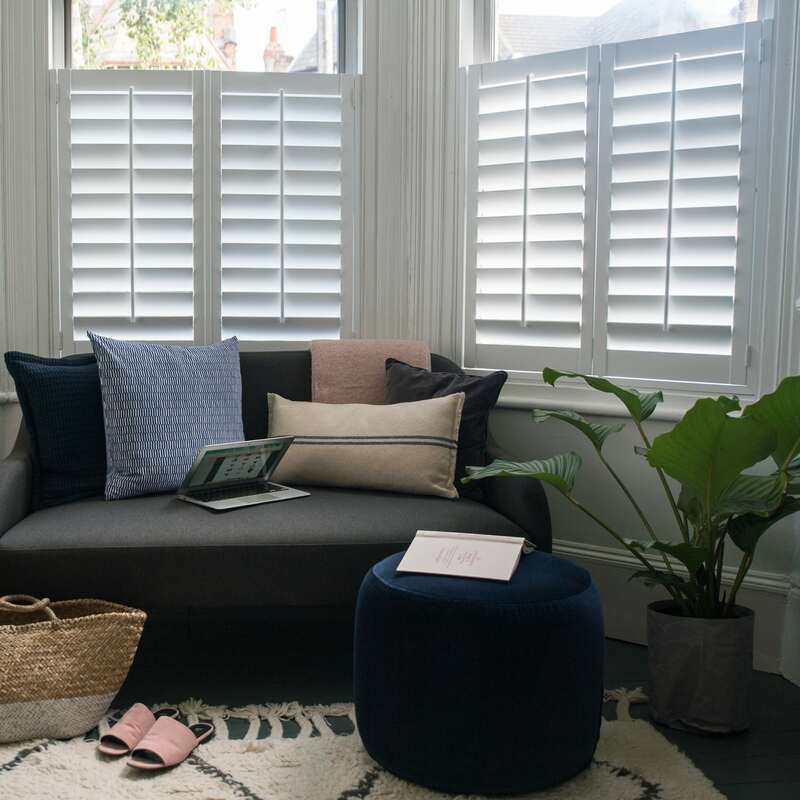 Ive recently moved and are waiting for our cafe style shutters to be fitted in the meantime we have old curtains up, Im looking for new but done like anything I have seen so far, do you have curtains up with your shutters or have you left them without?